Test cricket is the oldest format of the game and has been played since 1877. Over the course of the last 140 years, plenty of new rivalries and series have cropped up that have enthralled cricket fans all across the world. At first, there was only The Ashes, which had a specific name and a storyline. However, with the passage of time, many more Test series developed that had their own names and the two teams involved started playing for a specific trophy. These trophies are known as perpetual trophies and at this point in time, there are 15 of them. Some of them are fairly recent additions while some others have been existence for a long time. Here is a look at 5 of those iconic perpetual trophies and why they have been named so. This trophy is contested between Tasman neighbours and rivals Australia and New Zealand and hence it has been given that name. The first Trans-Tasman Trophy was contested in 1985-86 in Australia and prior to that, the teams had contested in 6 Test series, the first of which was played in 1945-46. New Zealand won the first series in Australia 2-1 on the back of superb performances from their star bowler Richard Hadlee and then in the series in New Zealand, the Kiwis won the three test series 1-0 to retain the Trans-Tasman Trophy. Since then, Australia have been dominant in this fixture and have won 10 out of the 15 series that have been played since then. Three series have ended in draws. 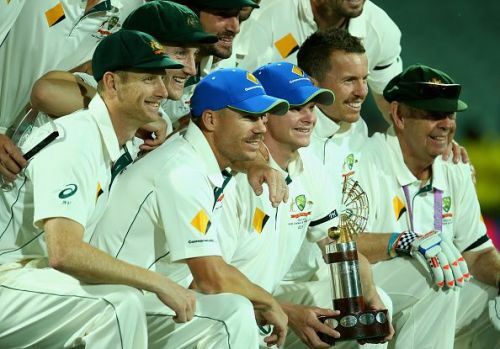 Australia are the current holders of the trophy, after having won in their rivals' den in the 2015-16 season.